At Uzor Windows & Doors, our mission is to provide premium products designed to compliment any home or commercial building. We strive to be the best in quality, craftsmanship, energy efficiency and service. Our job is to create attractive, long lasting and affordable products. 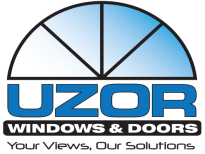 When you see the Uzor logo, you know you've made not just the right choice, but the best choice in windows and doors. Uzor Windows & Doors has moved to a new location! ​See our new address and contact information below.